I have a bike special made for the cycle holidays. It is designed to be as much field maintainable as possible. This means no suspention and hydrolic brakes. The stability of this bike is much beter than my old giant, even fully packed during bicycle holidays. The tires could not withstand the very sharp needles of the trees in namibia. The question is are the tire that can. Stable bike with nice driving behaviour. Quality has to be proven in future trips. I have a Giant Freerider, on this page you find technical information about this bike, also there is a evaluation included about its performance. 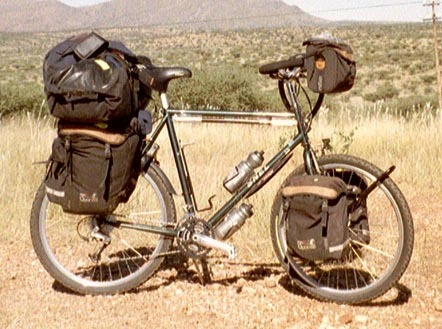 I stopped using this bike because on bad roads the small tire and 28" wheel size was not suitable any more. The stability of this bike is very good, even fully packed during bicycle holidays. The brakes have a good performance during dry & wet conditions. I was not satisfied with some original parts of this bike. For example the front chain wheels, the where not exchangeable. And the mechanical construction was very weak, the first time one of the chain wheels bent away. So I replace it with original parts. This chain wheel broke in three parts. Now I have a Deore LX chain wheel and no problems any more. What I like the most of this bike are the tires the are really really good. I don't remember the last time that I got a flat tire. One year I drove about 10.000 Km with one pair of tires. Even the rear wheel profile was still 0.5 mm. The price/quality factor of this Gaint bike is good for starting with cycling holidays. For normal use the standard parts are good enough. But for more than normal use you better can spend more money to buy a bike with all Deore LX/XT parts. After 25000 km through several countries: Sweden, Iceland, Holland, New Zealand, China, Germany, Austria, Tjech Republic, England the life time was over. But in 2004 I did a some big maintainance. The rear wheel was given a new ribben and I replaced all spokes my self. After that the bike was used to cycle to berlin.